Bratislava, September 7 (TASR) – MP for the far-right Kotleba-People’s Party Our Slovakia (LSNS) Milan Mazurek won’t be prosecuted for denying the Holocaust on a social network, aktuality.sk website and Dennik N daily reported on Wednesday. According to aktuality.sk, an investigator has decided upon that the prosecutors won’t press charges against Mazurek, who happens to be a member of the parliamentary committee for human rights at the moment, for the comments in question written before he became an MP. „When it comes to the Third Reich, we only know lies and fairy tales about six million and soap made from Jews. Nothing but lies are taught about Hitler,“ wrote Mazurek. 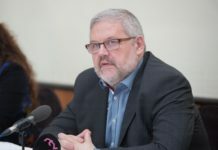 His comments were examined by the Regional Prosecutor’s Office in Presov and Prosecutor-General’s (GP) Office and they both came to the conclusion that Mazurek’s behaviour did not break the law, wrote the website. A police investigator in Presov originally rejected the matter, claiming that the MP with his comments on the social network didn’t commit a crime of the Holocaust denial. His superior, however, thought that the police investigator made his decision too early and turned to the prosecutors to take a closer look into the case. Holocaust denial has been a crime in Slovakia since 2001.